My first experience with Hudelot-Noellat’s was in my retail days in the early 1990s when we introduced them to Australia. I returned in 2005 angling for an allocation which was forthcoming after persisting for four years. 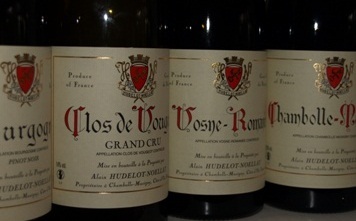 With a cache of superb vineyards brought together by the marriage of Alain Hudelot to Odile Noëllat from Vosne Romanée in 1960 Hudelot-Noëllat is a consistent first-rate red Burgundy producer. Their philosophy is simple, maintaining high average vine age, organic viticultural practices, ploughed vineyards and low yields. The elevage is controlled by the young and intelligent Vincent Munier (and more recently assisted by Alain Hudelot’s grandson Charles Van Canneyt). Ferments commence naturally and rise to about 32˚C and may include up to ten per cent stems. The wines are racked following the malo and are neither fined nor filtered prior to bottling. Four tonnelleries can be found in their large cold cellar with the majority being low toast Francois Frères; the Grand Crus receive up to 100% new wood, one-third new for the villages and two-thirds for the premiers. By and large these are wines with the concentration and structure which appreciate several years in the cellar. Please contact me for an allocation.